Database Master allows you to execute extended SQL, MongoDB and Linq(C#) Scripts, provides all database objects such as tables, views, procedures, packages, columns, indexes, relationships (constraints), collections and triggers. Database Master supports more then 40 data sources which includes MongoDB, ArangoDB, Couchbase, NuoDB, Oracle, MySQL, Amazon Redshift, PostgreSQL, FireBird, SQLite, SQL Server, SQL Server CE, Azure SQL, Azure CosmosDB, SSAS Server, Apache Hive, IBM DB2, IBM Informix, IBM Netezza, Teradata, Apache Cassandra, Redis and Ingres database systems. It supports also ODBC, OleDB, Esri GeoDB, OData, AutoCad Plant3D, Web Services, .Net Objects, CiscoIS, IBM Notes, SharePoint, ShapeFile, XML , JSON , HTTP Rest data source connections. It supports Google Analytics and Google BiqQuery Services as a data source. Database Master provides powerful and intuitive extended SQL query editor for ad-hoc database queries and can execute all types of SQL query commands. The query editor is extended and can also execute .Net extension functions and methods. Using query editor, you can execute SQL commands or scripts against any database system or data source. Query Editor is multi-threaded and allows long running queries and can return multiple result sets. The query editor supports SQL Intelli-Sense, code completion, table fields, SQL operators, code highlighting, text find/replace and other user-friendly features. It supports ArangoDB AQL, Couchbase N1QL queries, CosmosDB SQL queries. Database Master provides powerful and intuitive extended JSON query editor for MongoDB database queries. It supports most used MongoDB query operations and commands. JSON Query Editor is multi-threaded and allows long running queries and return multiple result sets. The query editor supports JSON IntelliSense (Code Completion, Query Operators and Methods), code highlighting, text find and replace functions and other user-friendly features. Database Master provides SQL and JSON code checker or code parser to check the SQL code for SQL-99 grammar errors. JSON ( MongoDB Query) code will check only for JSON format errors. Database Master provides SQL and JSON statement formatter (beautifier) to convert code instantly into well-formatted SQL or JSON scripts. Database Master provides dynamic C# Scripting query editor which supports Linq to DataSet and Linq to MongoDB queries. This feature allows developers to run rich C#-LINQ query scripts using power of .Net Framework. C#-LINQ query editor supports code Intelli-Sense (Code Completion) and code highlighting features. Database Master allows users to export data from single or multiple database tables or views to common file formats. Data Export feature allows you to export into these file formats : SQL, XML, HTML, HTML5, CSV, MS Excel, MS Word, MS PowerPoint, OpenOffice Calc and Writer, RTF, PDF, XPS, JSON, dBASE and as PNG images. Users can export all database data and database structure (Table, View, Procedure etc.) as a SQL Script for database backup. Database Master allows users to import data into database tables from XML, CSV and SQL files. It allows also data import from other database system using database connections. It provides bulk SQL-Script import without any size limit. The import results will be reported in a log file. Data Package feature allows you to easily bundle and export your database or table data as a data package and share them with other users or applications. Data Package allows you to export and import your sensible data without data corruption and data loss. The data package can be protected with a password for data security and protection. Database Master allows you to manage MongoDB, PostgreSQL and MySQL database users, provides user reports and data source information. Database Master is one of the best management tool for MongoDB and provides powerful MongoDB management features. It provides JSON Query Editor, Advanced Data Editing, Collection Manager, Index Manager, GridFS Manager, Visual Map&Reduce Editor, Visual Query Search, Tree and Table style data view and rich data export features to common file formats. Datbase Master supports Esri GeoDB database system (SDE and File based) with Oracle, SQL Server, PostgreSQL, DB2, PersonalGDB and FileGDB database systems. It can execute the SQL queries and lists all FeatureClass and Standalone Tables. Database Master provides SSH tunneling, also known as SSH port forwarding. SSH tunneling allows you to create an encrypted connection between your local machine and at the remote database engine. Database Master provides database object reports (tables, views, procedures, collections, indexes, relations reports etc.) and database system metadata reports for all database engines. Users can also report the table data or query results. Database Master provides a Table Data Editor feature which allows to create, edit and delete table data including BLOBs(Text, Images, Files, Docs etc.) with an advanced data editor. This makes it easy to alter data and create or delete rows without SQL commands. 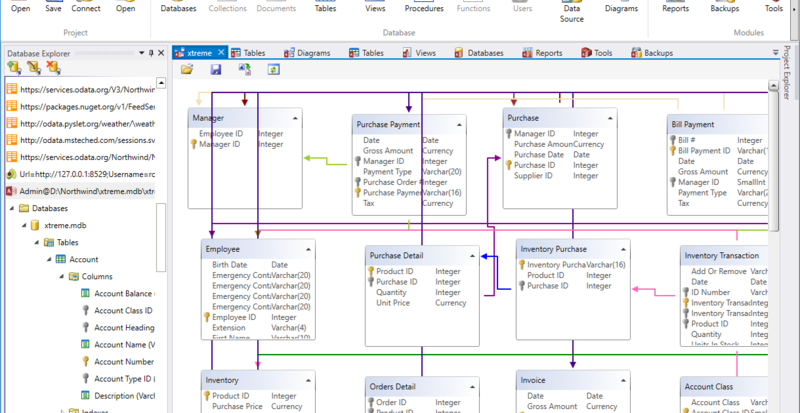 Database Master provides visual database designer and can visualize database tables (entities) and table relationships. Using database designer you can easily create database tables and foreign key relationships between tables. Database Master provides powerful and easy to use database monitoring tool for Oracle, MongoDB, MYSQL, PostgreSQL, FireBird, Informix and DB2 database systems. It provides pre-defined database monitoring items. Database Master provides a quick database backup and import system for MySQL, PostgreSQL, FireBird, SQLite and MSAccess database engines. It is a native supported database backup system taht teh backup files can be import with another backup tools. Database Master can access MySQL, Oracle, PostgreSQL, SQLServer, SQLite database engines behind a firewall or remote server. It uses a server-side script to connect a remote database engine and executes the database commands. Database Master is used for working with databases by over 7,000 software developers and IT professionals, in over 120 countries, personal and enterprise, science, education and technology sectors. Database Master is downloaded more than 10,000 every month! Multiple Connections: Allows to manage database connections in a project file. Datasource Explorer: TreeView database and datasource object explorer. Database Manager: Create/Drop Databases: Allows to visualize all user and system databases. Extended SQL Query: Provides extended SQL query editor with intelli sense , code syntax coloring. Extended MongoDB Query: Provides extended JSON query editor for MongoDB with intelli-sense and code syntax coloring. Code Checker (Parser): Provides SQL-99 and JSON format script parser for grammar errors. Code Formatter: Provides SQL and JSON code formatter or beautifier. C# Scripting: Allows to execute .Net (C#) based scripting using database connection. Extensions: Provides dynamic high level .Net extension methods and functions to execute. Intelli-Sense: SQL and JSON Query Editor with Code Highlighting and Intelli-Sense wth Code Completion. User Manegament: Provides user management for database systems. Data Visualizers: Provides Text, Html, Hexe, Chart Visualizer and Image Visualizer for BLOB data. Table Data Editor: Create, Edit or Delete Data Records or Rows. Maintenance: Provides database and table maintenance options. Data Export: Supports export to XML, JSON, CSV, HTML, MS Excel, MS Word, OpenOffice, PNG, PDF, XPS, MSAccess, SQLite file formats. SQL Script Export: Allows to export database structure and data as a SQL Script. Data Package: Allows to export and import data as a data package. CSV Data Import: Import data from CSV files. SQL Script Import: Import data from SQL files. XML Import: Import XML files into your database system. Data Import:: Allows to import data from other database systems or files. MongoDB Data View as Tree and Table style. Code Factory: Template based code generationg (C# or Java) using database schema. Templates: SQL/JSON/C# Templates for database object editing or creating. Schema Export: Export your database schema as a XSD file. MongoDB GridFS: GridFS editor for handling MongoDB file system. MongoDB Map/Reduce Editor: Provides Map&Reduce editor for MongoDB. Database Monitoring: Monitors database systems with advanced charting system. Database Backup: Allows to backup your database as a single file. HTTP DB Bridge for remote database access behind a firewall. HTTP DB Proxy for remote data source or database engine access. Nucleon Database Master supports more than 30 database systems and data sources. WebDbProxy to access any data source using a PHP script file.